This CellML version of the model has been checked in COR and OpenCell. The units are consistent and the model runs to recreate the published results. In the paper described here, Philip Stewart and colleagues present a details of their newly developed model for the human Purkinje cell including validation against experimental data. Ionic mechanisms underlying the heterogeneity between the Purkinje fibre and ventricular action potentials in humans and other species were analysed. The newly developed Purkinje fibre cell model adds a new member to the family of human cardiac cell models developed previously for the sino-atrial node, atrial and ventricular cells, which can be incorporated into an anatomical model of human heart with details of its electrophysiological heterogeneity and anatomical complexity. 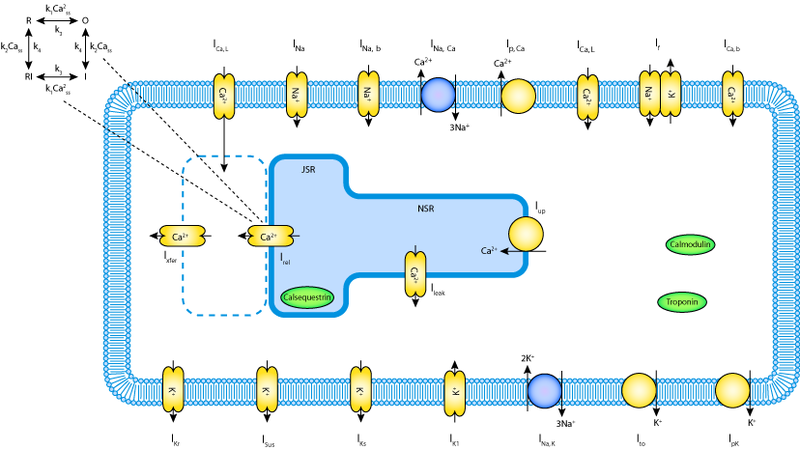 A schematic diagram describing the ion movement across the cell surface membrane and the sarcoplasmic reticulum, which are described by the Stewart et al. 2009 mathematical model of the human Purkinje fibres. Derived from workspace Stewart, Aslanidi, Noble, Noble, Boyett, Zhang, 2009 at changeset 49ffbf9b8e8c.